Disclaimer: This is a subjective review. It is in no way meant to disparage or endorse the product or the creator/company associated with the product. The sole intent is to share information about the practical characteristics of the product that may not be found at any other information source/website. Dh gave me the Storm Water Scarf pattern with a lovely skein of Hand Maiden Sea Silk from Colorsong Yarn. I really enjoyed my last lace projects, so I dove right into this one on Christmas Night. 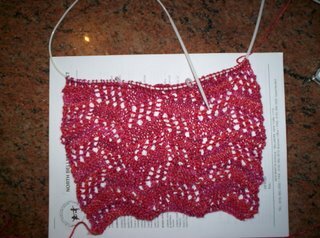 My joyous knitting came to a screeching halt when I realized that my needles, size 4 Addi Naturas that had served me so well in my Razor Cami project were not the best choice for this particular project. They stuck too much for the Sea Silk, and the points, although pretty pointy, were not pointy enough to grab the k2togs. What to do? I thought about sanding down the points but decided to buy another set of needles while I was in Knit Away in Brooklyn, which was the very next day. I picked myself up a lovely pair of Crystal Palace #4 circs. I wanted to use circs on this project because I imagined doing this while at various doctor appointments, lacrosse games, and in general, waiting in the car for kids to emerge from wherever. The CPs did not work as I planned, however. The joins caught the Sea Silk and didn't want to let go without a fight. I happened to be around Knit Away again a few days later (I know, weird considering I'm 45 minutes away) and picked up a beautiful pair of Susanne circs in a size #4. All I've ever read was that these needles were primo. Well, they might be for some things but not for me when it comes to lace. The points were too blunt and the wood, while feeling light and luxurious was still too sticky for the Sea Silk. Why didn't I check first before plopping down $18 + tax? It was stapled shut so you couldn't see the points. AARG! Now I was on a mission. A woman possessed. I sanded down my Addi Naturas and thought I would achieve knitting nirvana. Still, the wood was too sticky and the joins too grabby. I kept looking at my measly few rounds of my pattern worried that it was destined for the UFO pile. I traveled to Knit in Greenvale a week later and bought my first set of Addi Turbos. I now know what everyone is talking about when they gush over those shiny silver Addis. They are the smoothest needles I've ever used. The joins are not like joins - just part of the needle. But the glare - I felt like I needed sunglasses! And the Sea Silk was too slippery on the metal. I kept feeling like I was about to fall off a cliff. And now I was feeling like Goldilocks, trying to find the needles that fit just right. So I consulted the vast wisdom of the internet, and read that some people love Bryspun Flex needles. I ordered a pair on Ebay and received them today. The project has been smooth sailing ever since. The points are long and delicious, sorting out the YOs and lifting them no matter how tightly wound. The joins, while not Addi Turbo joins, are doing their job and mostly staying out of the way. I feel more confident with no frogging since I switched. I must admit after using glamorous woods and super slick metals with wonderful cables, these white plastic things did feel a little like they came from the box with all my old childhood crafty things - the spool knitter, the cross-stitch with the Girl Scout Trefoil on it, but somehow they are superior to me for this particular project. The only thing? They're squeeky. Not squeeky like an old door squeeky, but kind of like a new pair of sneakers squeeky. So I am getting over the sensory aspect of this project - and I think I will actually finish this. Now I have FIVE pairs of size 4 needles. Bryspun Flex - I've never heard of those! Can't wait to see. Your yarn looks beautiful! It must feel great. I have no patience for lacework right now. I make too many mistakes and get frustrated. I really admire lace knitters. Wow, when you first started talking about your Addi's, I thought mine are always too slippery for silk. I didn't realize they come in wood too. The things you learn on blogs. Glad you found some that work.